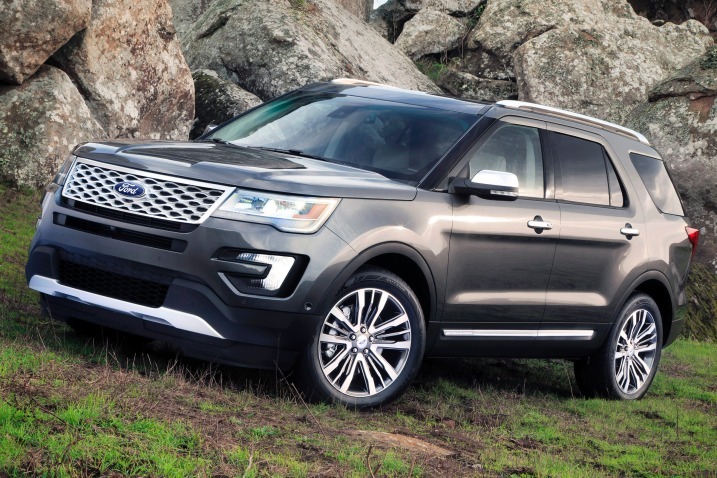 For 2016, the Ford Explorer receives a variety of changes and updates. These include refreshed exterior styling, minor interior revisions, updated safety features, revised suspension tuning and a new top-end trim level (the Platinum). 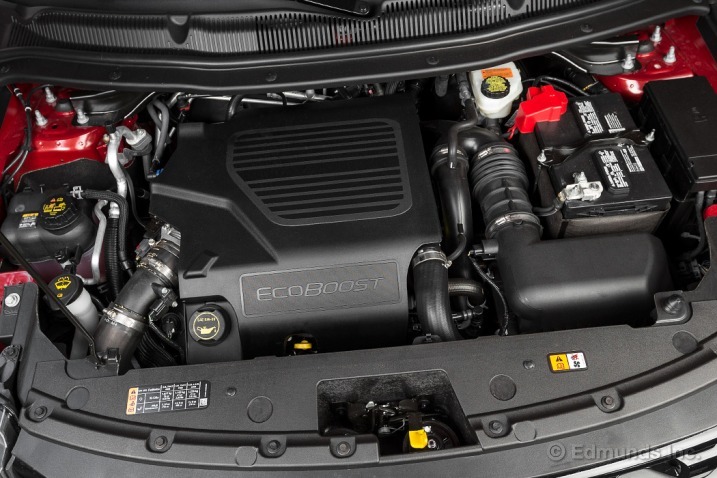 There’s also a new engine option, a 2.3-liter EcoBoost four-cylinder that replaces the previous, less powerful 2.0-liter EcoBoost four-cylinder. The old four-cylinder couldn’t be paired with all-wheel drive, but the 2.3 can be. If you have a large family, chances are you probably want a large and spacious vehicle to haul around your brood. Maybe you think a useful amount of towing capacity would be nice, too. But you also want the vehicle to have decent road manners and fuel economy. The 2016 Ford Explorer meets those requirements and is newly updated this year, taking what was already an upscale offering and making it even better. The 2016 Ford Explorer doesn’t look vastly different from the outgoing model (the new LED headlights and grille are the most notable aspects), but there are quite a few hidden changes. 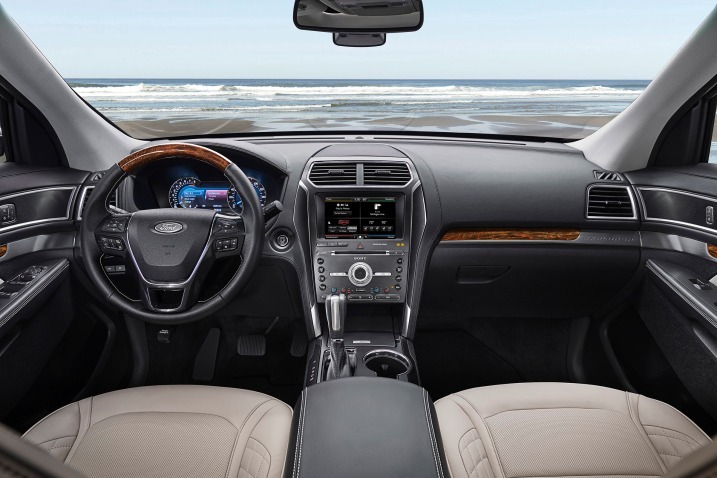 Inside, you’ll find added USB charging ports to keep your family’s techno gear running, as well as new tactile buttons for the optional MyFord Touch system that are easier to use than the previous touch-sensitive ones. Some features have been improved as well, including the enhanced automated parking system that not only can park in a parallel space but can pull into and out of a perpendicular parking space as well. 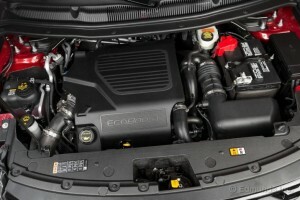 Then there’s the enlarged optional turbocharged four-cylinder engine that makes more power returns better fuel economy according to Ford’s estimates. Importantly, the new engine can now be paired with all-wheel drive and, when properly equipped, tow up to 3,000 pounds. 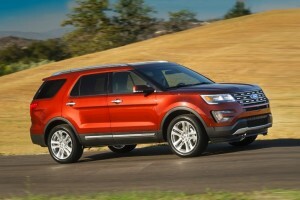 This year’s Explorer also has a new top-end Platinum trim level. It comes with just about every tech and safety feature from the Explorer’s arsenal as standard, plus upgraded interior upholstery and trim that just adds to the Explorer’s already high-quality cabin. Revised suspension tuning for greater comfort should also further the Explorer’s credentials as an upscale and refined three-row crossover. Despite its many updates, though, there are some drawbacks that went unaddressed. Even in a segment of relative automotive behemoths, the Explorer feels pretty big behind the steering wheel and can be harder to park and see out of. This is particularly noteworthy when you consider that many crossover rivals also have superior cargo space and more third-row legroom (along with the option for eight-passenger seating). In other words, it feels bigger despite actually being smaller. As such, it would be wise to consider its many competitors. For maximum cargo space, you’ll want to check out the Chevrolet Traverse and its GMC cousin, the Acadia. A well-rounded option for efficiency and comfort is the Toyota Highlander. The redesigned 2016 Honda Pilot is definitely worth consideration as well, as it offers improved driving dynamics and a more spacious, versatile interior. Even alongside these strong competitors, though, the 2016 Ford Explorer is a more compelling offering than it recently has been. We recommend that you do some shopping around before making a decision, but the Explorer is a vehicle to keep on your short list. The 2016 Ford Explorer is a large three-row crossover SUV available in five trim levels: base, XLT, Limited, Sport and Platinum. Standard equipment includes 18-inch alloy wheels, automatic LED headlights, LED taillights, rear privacy glass, roof rails, a rearview camera, cruise control, air-conditioning, rear climate controls, a 60/40-split second-row seat, 50/50-split third-row seat, a six-way power driver seat (manual recline), a tilt-and-telescoping steering wheel, a 4.2-inch display screen, Sync (Ford’s voice-activated phone/entertainment interface), Bluetooth phone and audio connectivity, and a six-speaker sound system with a CD player and USB/auxiliary audio inputs. The XLT adds upgraded brakes, body-color door handles, foglights, heated exterior mirrors, rear parking sensors, a leather-wrapped steering wheel, a keyless entry code pad and push-button ignition, an eight-way power driver seat, a six-way power front passenger seat and satellite radio. For the XLT, the Equipment Group 201A package adds dual-zone automatic climate control, remote start, a nine-speaker sound system and the Driver Connect package that includes an auto-dimming rearview mirror, an 8-inch touchscreen display (MyFord Touch), configurable gauge cluster displays, an SD card reader and upgraded Sync functionality. The 202A package includes all of the 201A equipment plus leather upholstery, heated front seats and front parking sensors. The Limited gets the XLT 202A’s equipment, plus 20-inch wheels, chrome exterior trim, a front-view camera, a hands-free power liftgate, driver memory settings, power-adjustable pedals, ventilated front seats, heated second-row seats, a power-folding third-row seat, an eight-way power passenger seat, a power tilt-and-telescoping steering wheel, a 110-volt power outlet, a navigation system and a 12-speaker Sony sound system with HD radio. Optional for the Limited is the 301A package (a.k.a. 303A with the 2.3-liter turbo engine), which includes automatic high beams, automatic wipers, an auto-dimming driver-side mirror, an automatic parallel- and perpendicular-parking system, lane-departure warning/intervention system, a blind-spot warning system, rear cross-traffic alert, massaging front seats and inflatable seatbelts for second-row outboard passengers. Stand-alone options include adaptive cruise control with forward collision warning and brake priming and a Trailer Tow package. The Explorer Sport is equipped similarly to the Limited, but some of the Limited’s standard features are optional here. You get different 20-inch wheels, a sport-tuned suspension and unique interior and exterior trim details. The Sport’s 401A package adds the power-folding mirrors, front-view camera, hands-free power liftgate, 110-volt outlet, driver memory settings, power-adjustable pedals, a navigation system, ventilated front seats, a power-adjustable and heated steering wheel and the blind-spot monitoring and rear cross-traffic alert safety features. The adaptive cruise control is again optional. Other options for the XLT, Limited and Sport include a dual-panel sunroof, second-row captain’s chairs (with available power-assist fold) and a rear-seat entertainment system with dual headrest-mounted displays. At the top of the Explorer food chain is the new Platinum. It includes the Limited’s 301A package items plus the dual-panel sunroof, adaptive cruise control, upgraded leather upholstery, aluminum and wood interior trim and a premium Sony audio system. The only options for the Platinum are the rear entertainment system and the second-row captain’s chairs with power-assist fold. Standard on the Base, XLT and Limited trim levels is a 3.5-liter V6 engine that produces 290 horsepower and 255 pound-feet of torque. With this engine, you have your choice of standard front-wheel drive or optional all-wheel drive. The latter gets hill-descent control, hill-start assist and Ford’s Terrain Management System, which is a selectable four-mode system that optimizes traction electronically for different conditions. 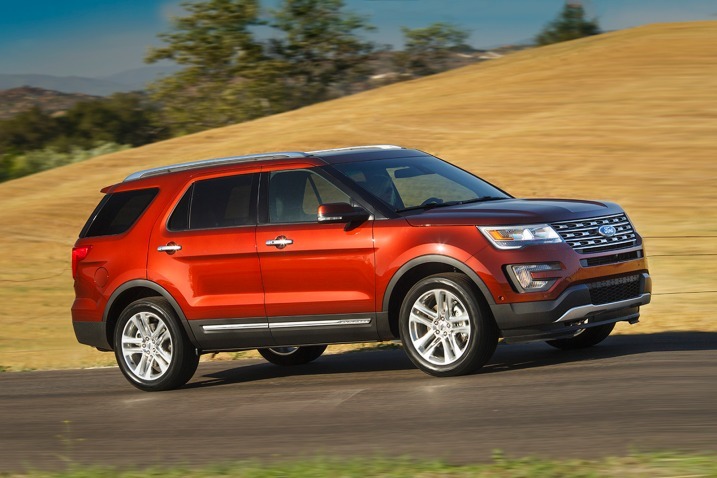 According to the EPA, a front-drive 2016 Explorer with the V6 will deliver 20 mpg combined (17 city/24 highway). With all-wheel drive, the V6 drops slightly to 19 mpg combined (16/23). In Edmunds testing, an AWD Explorer Limited with the base V6 went from zero to 60 mph in 8.4 seconds. Optional on base, XLT and Limited Explorers is the fuel sipper of the group, a turbocharged 2.3-liter four-cylinder engine making 270 hp and 300 lb-ft of torque. A six-speed automatic and front-wheel drive are standard; all-wheel drive is optional. Fuel economy rises to 22 mpg combined (19/28) with front-drive and 21 mpg combined (18/26) with AWD. Properly equipped, the four-cylinder Explorer can tow 3,000 pounds. The Explorer Sport and Platinum trims come with a turbocharged 3.5-liter V6 engine that puts out 365 hp and 350 lb-ft of torque. A six-speed automatic and all-wheel drive are standard. The EPA says to expect 18 mpg combined(16/22). Properly equipped, an Explorer with either of the V6 engines can tow 5,000 pounds. In Edmunds testing, the Sport went from zero to 60 mph in 6.3 seconds, which is very quick for this segment. Standard safety equipment for the 2016 Ford Explorer includes stability and traction control, trailer sway control, front-seat side airbags, side curtain airbags, a front passenger knee airbag and MyKey, which allows parents to specify limits for vehicle speed and stereo volume. 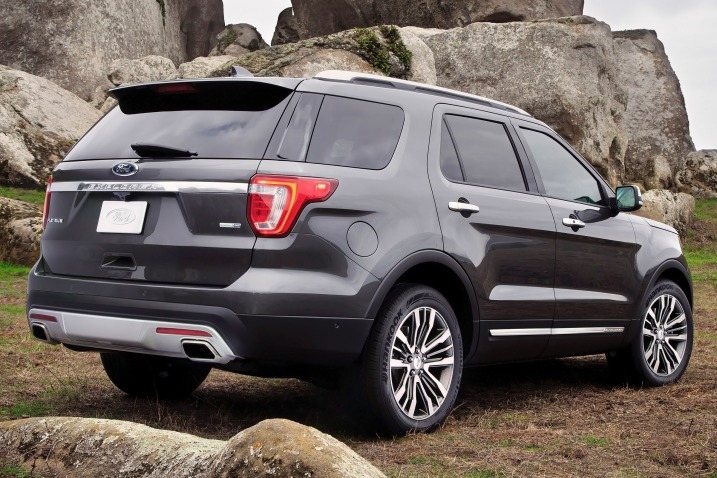 The Explorer’s stability control system also includes Ford’s Curve Control, which can monitor speed carried into a corner and decelerate if necessary. A rearview camera is standard on the Explorer, while a 180-degree front camera is optional. Rear parking sensors are also standard on all but the base Explorer. Optional on the Limited and Sport but standard on the Platinum is a forward-collision warning system with brake priming (bundled with the adaptive cruise control), lane-departure warning and lane-keeping assist (Limited only), a blind-spot warning system (with rear-cross traffic alert) and inflatable seatbelts for second-row outboard passengers. In government crash tests, last year’s Explorer earned a five-star rating (out of a possible five) for overall crash protection, with five stars for total front-impact protection and five stars for total side-impact protection. The Insurance Institute for Highway Safety gave its top score of “Good” for the Explorer’s performance in moderate-overlap frontal-offset, side-impact and roof-strength tests. It received the second-lowest rating of “Marginal” in the small-overlap frontal-offset test. Its seatbelts and head restraints earned a “Good” rating for whiplash protection in rear impacts. While the Explorer has the commanding ride height expected of an SUV, its thick roof pillars, high hood and tall dash limit outward visibility. Even with all of the available parking aids, it’s a handful in tight spaces and in general feels much bigger than it really is (not a good thing for such a large vehicle). From a fit and finish perspective, though, the Explorer’s interior is pretty well-trimmed. Materials are attractive and luxurious, with a soft-touch dashboard and precise-feeling controls. The front seats welcome a wide variety of body types, and the cabin is particularly quiet as well. The optional MyFord Touch interface contributes to the premium vibe, as it adds a high-resolution touchscreen to the center console, plus two additional screens for the gauge cluster. It isn’t the most user-friendly system, but it has been improved over the years and now works reasonably well (especially compared to the standard MyFord system). A welcome change for 2016 is the replacement of the touch-sensitive audio and climate controls with physical buttons. Cargo space in the Explorer is a mixed bag. The deep well left behind by the raised third row leaves a more useful cargo area with all rows in place than anything in the segment, save the mechanically related Ford Flex. On the other hand, its 81.7 cubic feet of maximum cargo space is less than in most rivals, especially the Chevrolet Traverse and GMC Acadia. The Explorer’s seating may be a bit disappointing for families as well. Second-row comfort is adequate, but overall it’s just not as roomy (particularly for installing rear-facing child safety seats) as we’d hope for in a vehicle of this size. Third row space, meanwhile, very much depends on the second-row design. If you get the standard fixed bench, there is a dearth of third-row legroom, allowing only small children to fit comfortably. Opt for the sliding second-row captain’s chairs and move them up, however, and even larger adults will fit in the aft-most row. Of course, the Explorer is reduced to six seatbelts in that configuration. The Ford Explorer has a smooth ride quality on the highway, with good composure that gets only a little busier with the available 20-inch wheels over broken pavement. It’s also particularly quiet, which is an added benefit for any highway journey. It handles securely in typical driving situations, but overall it feels larger and less maneuverable than similarly sized rivals. The same is true of the Explorer Sport, but thanks to its sport-tuned suspension and steering, it reacts more quickly to inputs and generally imparts greater driver confidence. And while the Sport gives up a bit of that cushy ride quality, it’s still well within the realm of acceptability for this class of vehicle. The Sport and Platinum trims also come standard with the turbocharged V6, and its V8-like power numbers result in quick acceleration that’s unbeatable in the large crossover segment. The regular V6 isn’t as peppy but should still readily meet the expectations for most three-row crossover shoppers. As for the new turbocharged 2.3-liter four-cylinder, it’s the least powerful of the three engines and can struggle to hold a gear on grades or authoritatively help you merge with freeway traffic. We’ve yet to subject it to instrumented testing, though, so check back later for specific details.